Nearly 7 million visitors make their way to the handsome city of York in Northern England each year largely due to its architecture. The walled city’s medieval buildings and Georgian townhomes are remarkably well preserved. Home to two universities, The University of York and York St. John University, the city has youthful energy and on weekends the cobblestone streets are packed with revelers late into the night. In December 2014, York became the only city in the U.K. to be designated a City of Media Arts by UNESCO. It’s awarded for digital and creative excellence. The first York Mediale, an international media arts festival celebrating film, TV, art, theatre, and multimedia is taking place through October 6, 2018. The Merchant Adventures Hall (The Hall, Fossgate), a medieval guild hall where merchants conducted business, charity and worship for over 600 year, is one of York’s finest historic sites. A museum, visitors can view the Great Hall, the Undercroft and the Chapel as well as ogle the merchant’s impressive silver collection. Merchant’s Coffee House by Café NO.8 serves locally roasted coffee and homemade cakes and other light bites in a space that is inspired by travel and trade. York’s magnificent York Minster (York Minster, Deangate) is one of the finest medieval buildings in Europe. The cathedral has been the center of Christianity in north England since the 7th century. It contains the largest expanse of medieval stained glass in the world. Wylie and grandma at Eagle and Child. 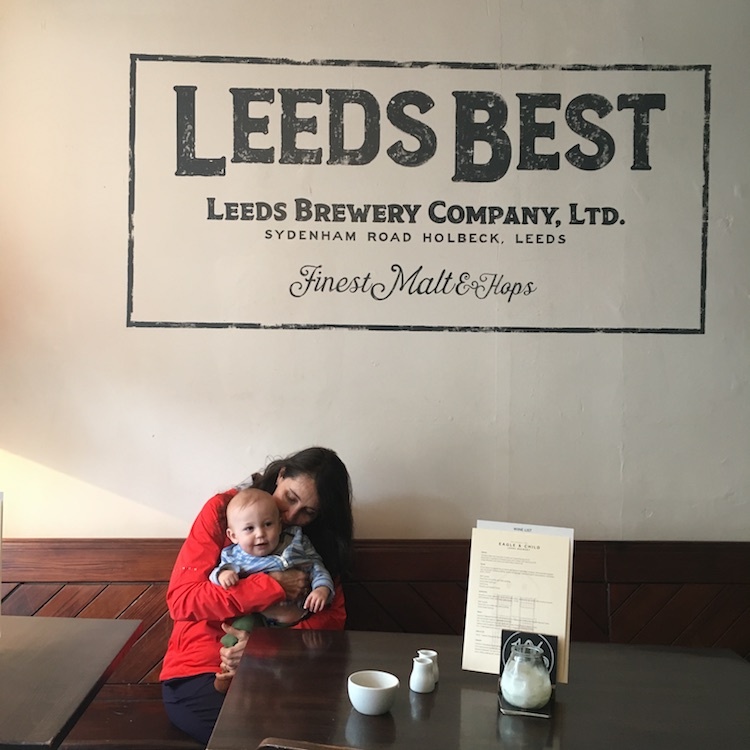 Located in a 1640 timber-framed building, the charming Eagle & Child brewery (9 High Petergate) is a perfect place to break for lunch. Take a seat on the patio or walk up to the staircase to the second story where the uneven floor gives the space plenty of charm. If you happen to be in York on Sunday make sure to go to Eagle & Child for Sunday Roast. 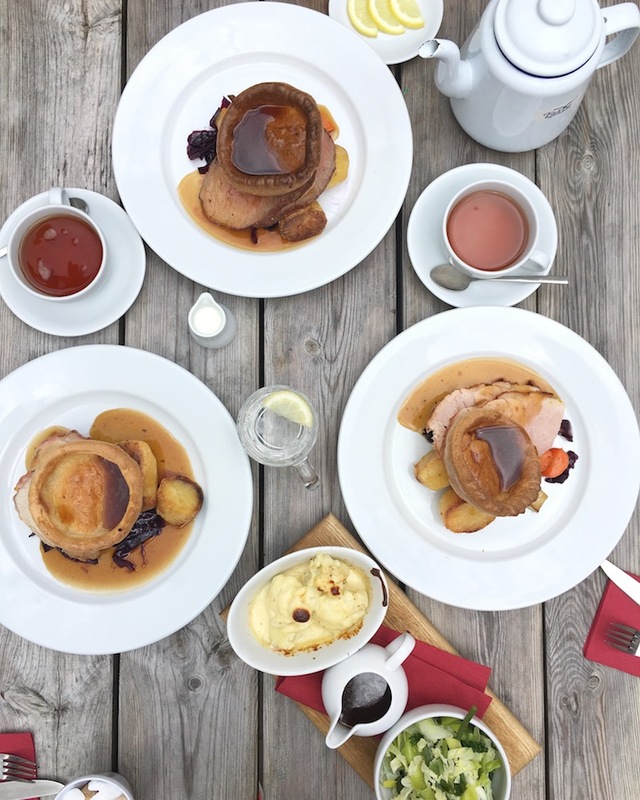 The British tradition consists of a large hearty lunch including plates of honey glazed ham, roasted potatoes and Yorkshire pudding. The Sunday Roast spread at Eagle & Child. If you didn’t arrive by train, take time to marvel at York’s Victorian railway station (Station Road). It was the largest in Britain when it was completed in 1877. Built on a curve, the 800 ft.-long train-shed held up by 42 ft. tall iron columns is a feat of ingenuity. Continue on message with a visit to the National Railway Museum (Leeman Road), a ten-minute walk from the center of town. York’s only national museum has giant halls full of historic trains like the Mallard, the world’s fastest steam locomotive, the Shinkansen Bullet Train and a Royal Train that includes Queen Victoria’s luxurious saloon. The Shambles, lined with Elizabethan buildings, may have been the inspiration for Diagon Alley. 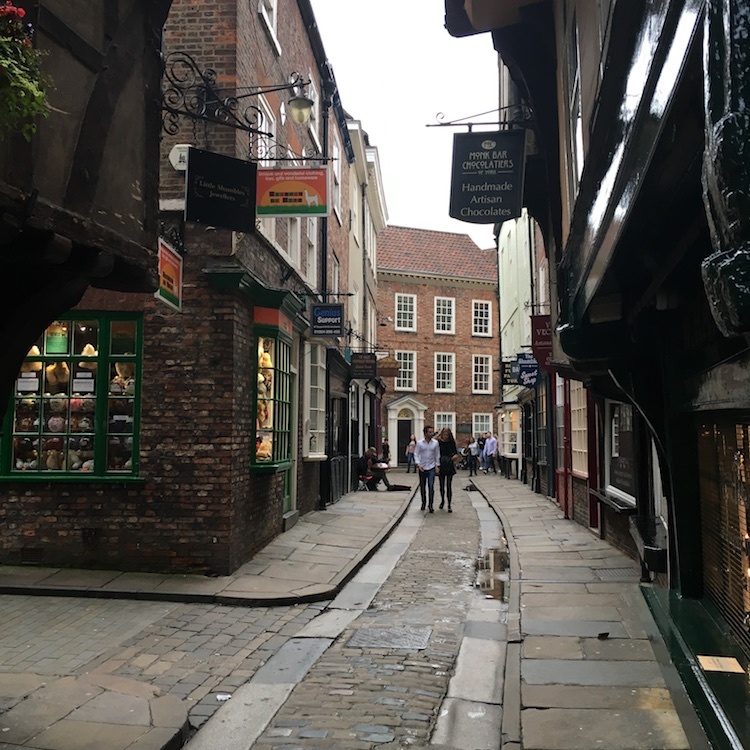 Walking along the off-kilter Shambles, a one time meat-market street with overhanging half-timbered buildings might make you feel slightly off-balance like you’ve strolled through a funhouse. The Shambles was reportedly the inspiration for the wizarding alley Diagon Alley in the Harry Potter novels. The Shop that Must Not Be Named (30 Shambles), a Harry Potter merchandise shop that stocks wands and robes, opened on the street in May. First licensed in 1644, Ye Olde Starre Inne (40 Stonegate) has the distinction of being the oldest pub in town. Tucked down an alley, the rambling bar with low ceilings and a patio has a good selection of U.K. beers on tap and homemade meat pies helping to keep it popular with locals. The Botanist (15-19 Stonegate), a globally influenced restaurant and bar that opened in late 2016 serves an eclectic menu that includes like lamb kofta kebabs with Piri Piri sauce and Jerk salmon. Botanical cocktails including a rhubarb and gin old fashioned and a pear and vanilla margarita are a big draw. The quaint cafe The Perky Peacock (The Postern Tower Lendal Bridge) is located in a stone tower that forms part of the city wall. The simple menu includes hearty bagels, cakes and coffee. 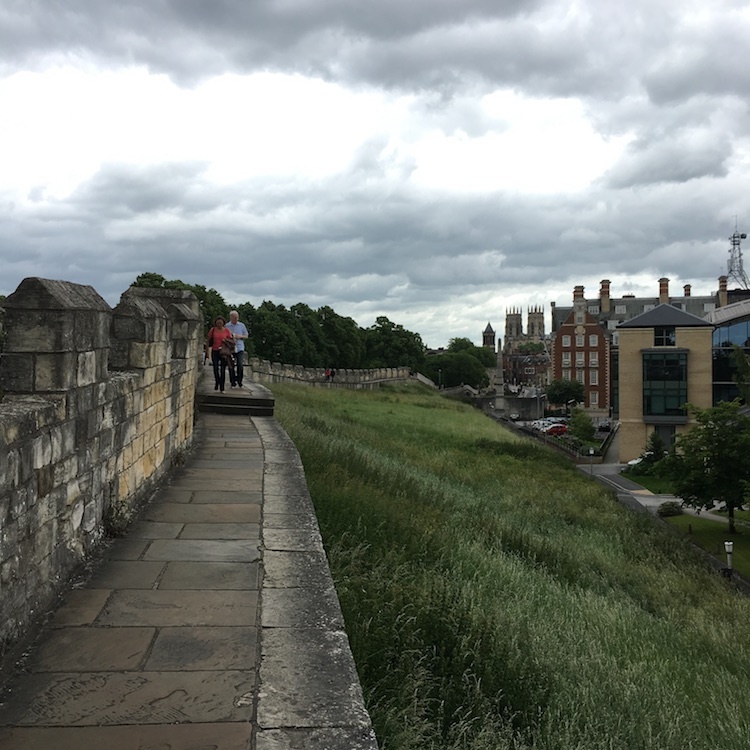 York’s ramparts are almost completely intact. York’s biggest claim to fame may just be its city walls. Fortified since Roman times, it has the most intact walls of any city in England. 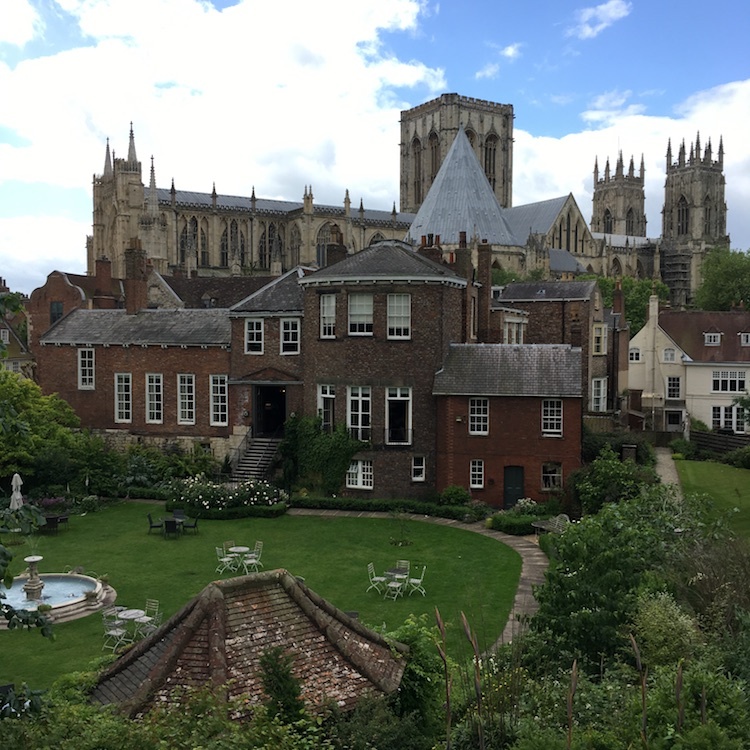 A two-mile loop allows you to walk along the preserved parts of the walls, through the medieval gatehouses that once restricted traffic into the city as well as to see some fine city views that include the spires of the York Minster, York’s imposing cathedral, and into the manicured backyards of local residents. Open since 1919, Betty’s Café and Tea Rooms (6-8 St. Helen’s Square) is a Yorkshire institution. Today there are several locations, but a table in the art deco Belmont Room overlooking St. Helen’s Square whisks you back to the time of founder Frederick Belmont. Belmont traveled on the maiden voyage of the Queen Mary and he commissioned the designers of the ship to create the room. The curved windows and wood paneling make you feel like you’re on a luxury ship. The Mansion House (St. Helen’s Square), home to the Lord Mayor of York since 1732, reopened as an improved visitor attraction in 2017 following a year-long closure and restoration. Visitors can view the grand stateroom and the extensive gold and silver collections. They can also discover what life was like downstairs in the fully restored Georgian kitchen. The Black Swan at Oldstead (Oldstead, North Yorkshire) is the only restaurant in Yorkshire with a Michelin Star. Chef Tommy Banks is the youngest Michelin star chef in Britain and he’s been featured in several seasons of the Great British Menu. You’ll need to rent a car or hire a taxi to dine here. The Black Swan is 20 miles north of York on the edge of the North York Moors National Park. With a great deal of farm fresh produce at its doorstep, the menu celebrates locally grown and foraged ingredients in dishes such as ox cheek with lovage and beetroot crapaudine slowly cooked in beef fat. The Black Swan rents rooms as well. This Victorian townhouse hotel a short walk from the city center is a wonderful value. Rooms are furnished with antiques and it has a low key restaurant and bar. Grays Court is located in the shadow of the York Minster. Parts of this boutique hotel date back to the 11th century. Luxurious guestrooms feature standing tubs and many have views of the lush garden that backs up to the city walls. This recently refurbished hotel is steps from the train station.. The 155 guestrooms feature a neutral color palette and many have views of the Minster. Going to London during your U.K. trip? Check out this Neighborhood Guide to Holborn.